Please forgive the fuzziness of the pictures, but at least I took them, and posted them! The camera strap got in the shot too. I guess it was tired of always being behind the camera and wanted to be in front for once. Oh well. 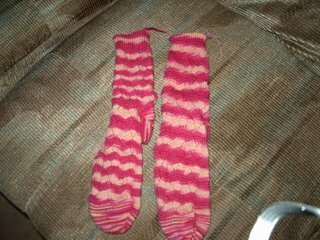 The socks match for the most part; something weird happened around the heel and caused the lighter pink and yellow stripe sections to be smaller. I have no idea what that is all about, but they're done! Woot! I have the address to send them, and they'll be in the mail on Tuesday! Woohoo! What fun! Is that a chevron pattern? I love my socks!!! Thank you so much. They don't fit however. :) I can't get the tops over my heel. 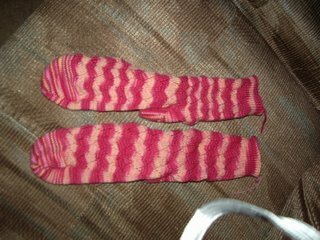 I am going to take them to my LYS and see if we can somehow fix them so they will fit.